Creating a free blog is the first step in establishing your online identity. A blog website allows you to write anything or showcase your creative skills and build a strong community around them. Forget about premium blog sites and web hosting solutions. They require investment which may not be affordable for the beginners in the early days. Today we’ll tell you how to create a free blog on Google Blogger and make money from it. Blogger aka Blogspot is a free blog publishing service from Google. It lets you create a free blog in minutes with a Google account and an active internet connection. The blogs are hosted by the technology giant itself and serve them with a blogspot.com subdomain. Blogger also allows users to use custom domains for their blogs. If you own a domain, just connect it to the Blogger servers and you are done. Thus you can override the default Blogspot subdomain and use www.yourwebsite.com for the blog. On the other hand, it provides limited customization options and fewer controls over the theme settings. WordPress.org users can find out thousands of templates and plugins from online marketplaces effortlessly that help you to customize and manage the site to any extent. But Blogger themes are numerous and you should do all other operations manually through coding. However, it’s a great place for beginners to launch a free blog. 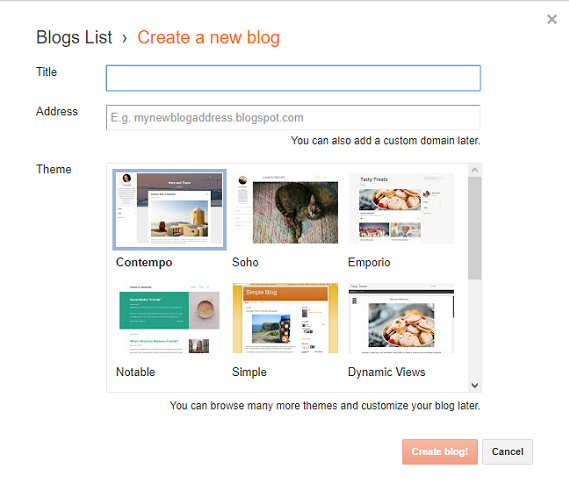 Click ‘Create your blog’ button and sign in with your Google account in the next screen. Once you logged in, Google will ask you to set a display name for your Blogger profile. Enter your name and hit ‘Continue to Blogger’ button. You will get a welcome screen as the next with an option to create your blog. 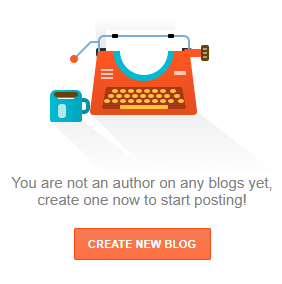 Click ‘Create new blog’ button to proceed. A new window will appear with options to enter your blog name, web address and choose a theme. Fill the title field with your blog name. It can be anything like technology tips, travel diary, cooking guide, etc which you can change anytime you want. Every website will have a unique web address. Set an identifier for your blog that serves with a blogspot.com subdomain. So your blog address will be like this ‘yourblog.blogspot.com’. Check if your blog address is available or not. If available, move to the next step to choose a template for your blog. You can change all these things including blog address and theme later from the settings panel. Click ‘Create blog’ button to save the settings made. Now Google will automatically bring you to the posts screen. Hit the ‘New post’ button to create your first blog post. Enter your post title and content. Format texts using the toolbar menu. It includes options to change font size, assign colors, add hyperlinks, upload media files, align paragraphs, and others. Once finished formatting, move to the right pane of your screen. 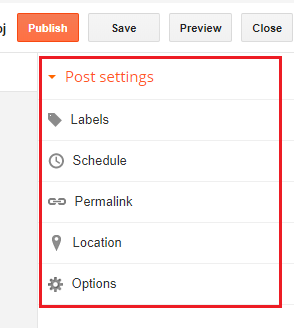 It allows you to set labels, schedule posts, customize permalinks, disable comments, etc. Hit the Preview button to see a preview of your post and if satisfied, click on publish. Congrats. Your first blog post has been published. Share it on your social media accounts to let others know about your new venture and increase the traffic. 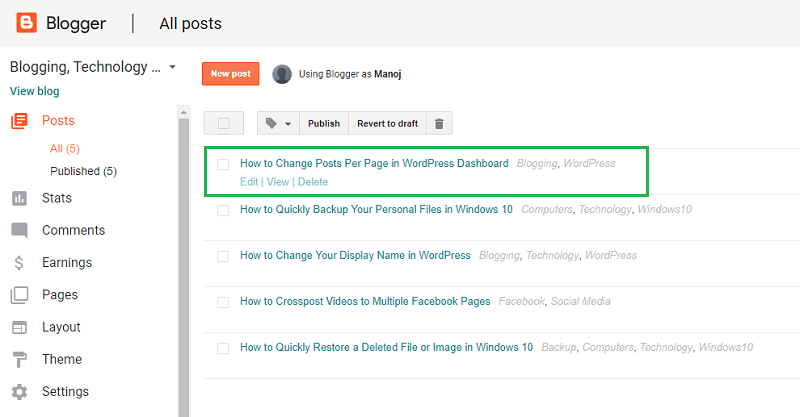 Visit your Blogger dashboard to manage your blog and posts. A user can create up to 100 free blogs per account. If you have multiple blogs, choose a blog that you want to edit from the top-left corner of the admin panel. Click Posts > All to edit a blog post. Mouse hover a post to get edit, view and delete options. Choose ‘Edit’ to open the corresponding post in editing mode or click on delete to send it to thrash immediately. Click Stats to monitor your traffic, referring sites, organic keywords, and audience. Click Comments to approve, delete, and reply to the comments you receive. Use the Earnings tab to connect your blog to AdSense and show ads. It is easy to place ads on Blogger blogs. Once connected, Google AdSense will automatically show ads on your posts and pages. It will pay you based on the ad impressions and user clicks. Visit the Layout tab to customize your blog layout, add widgets, create a favicon, etc. Click Theme to customize or change your theme and backup and restore the website. Click Settings to change your blog name, web address, and manage other site-wide settings. Want to use a custom domain for your Blogger blog? Click ‘Set up a third-party URL for your blog’ link under your blog address and follow on-screen instructions to set up www.yourwebsite.com for your blog. You should add two CNAMEs in your domain records to verify your ownership and connect it to the Blogger server. It may take up to 6 hours and after that, your blog visitors will be directed to the custom domain address. Still confused? Let us know your doubts through the comment form below. We’ll guide you on how to create a free blog on Blogger.